There was something eclectic about the Banaras Hindu University (BHU). As one crossed the gates, the sprawling campus came in view, representing a microcosm of the entire universe of education. Driving from the Sir Sunderlal hospital to the IIT and dairy farms at the end of the university, one would simply marvel at the genius of the man who founded it – Pandit Madan Mohan Malviya. 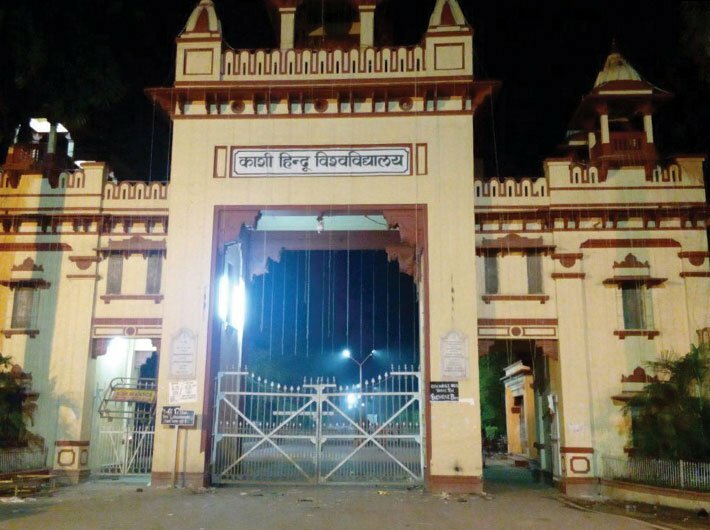 But the recent episode of alleged sexual harassment followed by girl students’ protests, subsequent use of force against them and its brazen justification by vice chancellor Girish Chandra Tripathi confirm the fear that there is something deeply rotten in the BHU. It has been rotting there for decades and has only now exposed itself in the most virulent form. There is nothing new in girl students taking a political position on the campus. The university has a legacy of illustrious girl student leaders on its record. But the campus was always a safe place for interaction of students. Academic dons living a Spartan life on the campus were role models for students and inspired instant awe and respect for their profound knowledge. But something went horribly wrong in the eighties. Today the university has been reduced to a rehabilitation centre for “incompetent and often lumpenised” legatees of academic dons. One does not need to go far to find this out. You take out the records of those recruited in the faculty and staff, and you will find that most of them are either relatives or scions of the people who occupied prestigious positions in the university. For instance, one important member of the proctorial board has got “adjusted” his four scions as university faculty. And mind you, he is not an exception. In any faculty except at the IIT and the medical college, the story is the same. How do these “incompetent scions” get admitted? If an agency scrutinised the academic records of these faculty members, it will be found that most of them had fared badly in high school and intermediate exams. Once they get into the university, their scale of performance takes a quantum jump and they become toppers. Such stories abound on the campus. Hence, it hardly comes as a surprise when the faculty is divided on caste lines. A Brahmin VC would face the wrath of Rajput staff or a Rajput VC would get no cooperation from Brahmin and Bhumihar faculty. OBCs and scheduled castes lobby within students and faculty would be no less inferior in flexing its muscle to subvert the education system. Perhaps everyone seems willingly or unwillingly complicit in toppling the BHU’s prestige. In the latest episode, a section of teachers, instead of becoming firefighters, stoked the flames on the basis of their prejudices. And the vice chancellor, who regards himself as the “chosen one” because of his proximity to RSS joint general secretary Krishna Gopal, handled the whole issue in the most cavalier manner. Insiders admit that given the outsiders’ access to the university, there were reports of eve-teasing happening all across the campus in the recent past. These complaints made by girl students were treated most shabbily by the proctorial board and the VC’s office. The incident that triggered the protests happened barely 50 yards away from the VC’s lodge. It merited a strong intervention and the girls needed to be assured that such instances would not happen in future. The university’s administration instead blamed girls for letting such molestation happen. What is particularly significant is the response of the university’s administration to girls’ complaints. It once again exposes the mindset of those running the institution. In their view, girls returning to the hostel as late as after 7 pm needed to be blamed for exposing themselves to “molestation”. Interestingly, none of them is ashamed of holding such a regressive view. This is the precise reason why the VC avoided going to the women’s college (WC) which is located quite close to his residence. Of course, a visit to the WC would expose to him a litany of charges about the poor quality of management in the girls’ hostels. And the VC, being the chief protectorate of this “rehabilitation centre of incompetence”, would not let this happen. Being an ex-student of the BHU, I am quite dismayed at rapid deterioration in the academics and governance of the institution. This is not the first time that the university has witnessed violent protests or hooliganism. In the early eighties, it was closed sine die many a time because a section of criminals were infiltrating students’ protests. But they were weeded out to restore a semblance of order. The soul of the BHU remained intact. However, the recent episode is indicative of a morbid atrophy that has afflicted the BHU’s soul.